Dubai, UAE, March 14, 2019: Your mother’s unconditional love and affection deserves high-end returns. For the fashion-forward mother, the HONOR View 20 Moschino edition would make for a perfect statement along with its branded accessories and the Moschino Teddy bear wallpaper. Your mother will not be out-of-reach or short of battery anymore thanks to the 4,000 mAh battery with SuperCharge. If your mum is health conscious and takes an account of every calorie she consumes, HONOR View 20’s 3D camera and AI capability will help her calculate how many calories contain in a meal just by pointing the phone at it. Spoil you mother with colours including Phantom Red and Phantom Blue which are part of the special edition released alongside the two regular colourways Midnight Black and Sapphire Blue. Is your mother’s smartphone overdue for an upgrade? This mothers’ day make your first lady feel special with an all-screen 6.5-inch bezel-less full HD screen display and a glass back packed together in the HONOR 8X. Powered by home-grown 2.2GHz octa-core Hisilicon Kirin 970 processor, your mother can enjoy the facial recognition technology on this device which is super-fast and opens the device in less than one second. This is the first smartphone display to be certified by TüV Rheinland that can reduce blue-light radiation and comes in an impressive range of black, blue and red colours. 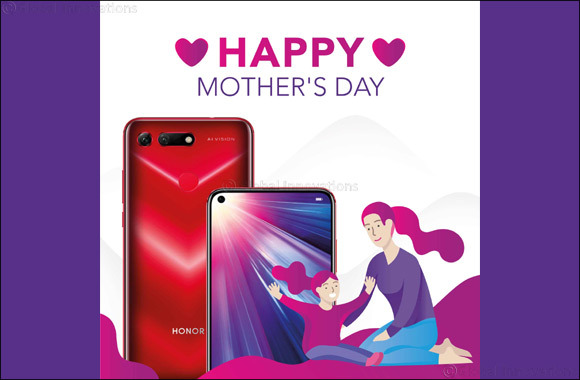 Celebrate motherhood with HONOR’s flagship device that packs in a powerful hardware as well as scores high in style and design. The AI-powered HONOR 10 Lite’s front camera will offer a superior selfie experience to your mother to smartly capture the best possible selfie in any moment. The front camera can intelligently recognize and optimize eight scenarios in real time with the AI-powered algorithm, enhancing the subject’s face and the background respectively by modifying dynamic exposure and applying colour adjustment according to different scene types. Spoil your mother with the AI beauty algorithm uses 3D facial recognition that offers customized beauty effects based on your age, gender and skin tone, allowing your mother to create her own definition of beauty. The phone comes in beautiful shades of Sky Blue, Shiny Red, Sapphire Blue and Midnight Black.